Extreme process temperatures need diaphragm seals with cooling elements, heat will degrade almost any mechanical or electronic device over time. Similarly, extreme process temperatures have been shown to dramatically reduce the functional lifetimes of sensitive measuring instruments, such as pressure gauges and sensors. A diaphragm seal is designed to protect your expensive measuring instruments from degradation caused by corrosive or high-temperature media. Designed in a variety of shapes, sizes and functionalities for specific applications, diaphragm seals are devices with fluid-filled space sealed off by a flexible diaphragm. The flexibility of the seal means the pressure effects of the process media will be transmitted through the diaphragm and can then be measured at the other end of the fluid-filled space. The engineers at WIKA report that a diaphragm seal itself will dissipate approximately 100°F of heat, and up to 300°F can be dissipated if you add a cooling element, such as a heat sink, to the seal assembly. A heat sink provides sensitive equipment with protection against both high and low process temperatures. A heat sink works by having the air flow on the heat exchanging fins equilibrating (reducing or increasing) the temperature of the diaphragm seal fill fluid. In effect, a heat sink is a temperature-dissipating buffer that at least partially equilibrates the temperature of the fill fluid before it reaches the pressure measuring instrument. As a general rule, the longer or larger a heat sink is, the more temperature it can dissipate, as surface area is the key factor in dissipation efficiency. A number of specialized industrial processes today operate at extremely high or extremely low temperatures, and these extreme conditions require specially designed measuring devices. WIKA’s experienced engineers can work with your team to help develop a custom diaphragm seal measurement solution to handle process temperatures ranging from below -100°F to +750°F. WIKA’s technical representatives can help you select the perfect off-the-shelf diaphragm seal and heat sink assembly for your applications up to 500°F. For very high temperature applications, your team will consult with WIKA’s engineering professionals to develop a custom diaphragm seal cooling element assembly specifically designed for your application. 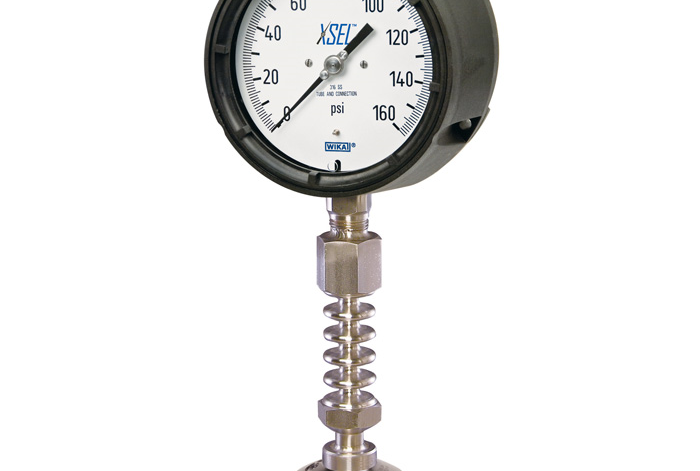 Don’t let your high- or low-temperature processes damage your expensive pressure measurement gauges and sensors. Call or email the diaphragm seal experts at WIKA, and our knowledgeable technical staff will help you assess your needs and find an ideal solution for your specific needs.